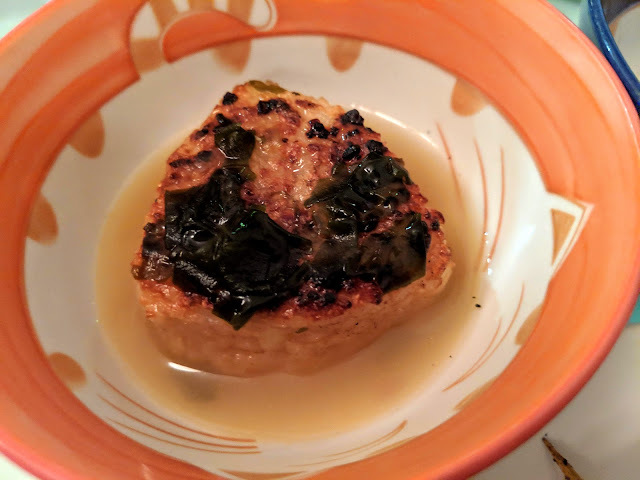 After doing quite a bit of travel to New York City recently, I have definitely been looking forward to pay renewed attention to gluten-free eats in my home city of Washington DC this month. As it happened, the Restaurant Association of Metropolitan Washington's (RAMW) winter restaurant week, occurring right in the middle of January, was the perfect excuse to seek out new eats in the new year. The beauty of RAMW restaurant week is that the menus are structured so that you get the rare opportunity to have a multi-course meal for an unbeatable price at some of the region's top restaurants. 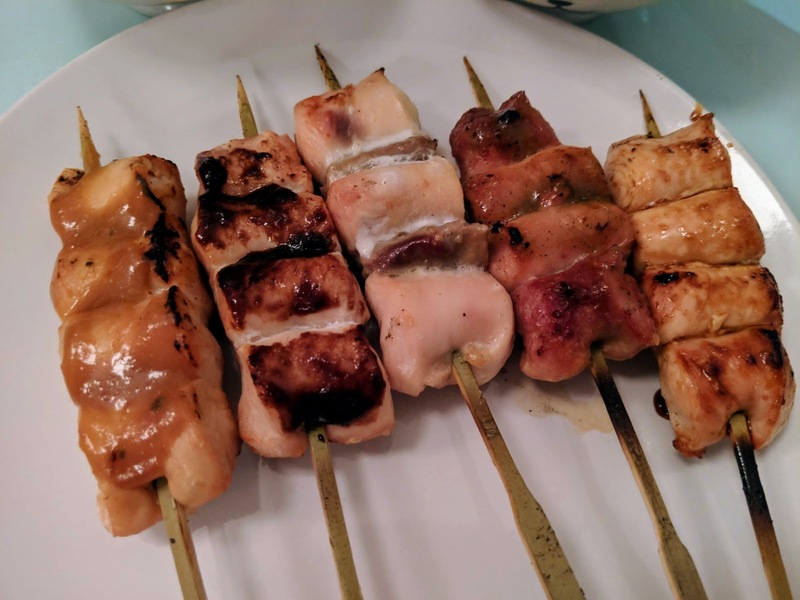 RAMW's website makes searching by neighborhood and cuisine a breeze, which is how I discovered Momo Yakitori, a Japanese restaurant in the quiet Brookland neighborhood. Serving up creative takes on the traditional yakitori style of street cuisine, Momo Yakitori's menu also happens to be completely gluten-free, which sold me on dining there in an instant. Excited to discover another dedicated gluten-free restaurant in DC and have a rare opportunity to enjoy Japanese fare, I eagerly anticipated my dinner each day leading up to it. Unmissable with it's adorable soft teal exterior, Momo Yakitori's atmosphere is cozy and warm as soon as you enter. The small space has limited seating (so reservations are a must, especially during promotions like this), but the intimate atmosphere makes this an ideal restaurant for dining with another person, or even on your own. The setting also enables Momo Yakitori's fare to take center stage, as I soon discovered, deservedly so. To make all of their dishes gluten-free, the restaurant uses San-J's gluten-free tamari instead of soy sauce. If you are vegan, all of the vegetable dishes on the menu can also prepared to accommodate this special diet. Momo Yakitori does caution though that they cannot accommodate for sesame, soy bean, or rice allergies. As we were seated, I let our waiter know that I was also dairy-free, and he helpfully guided me through the menu to point out items that couldn't be adapted to make them dairy-free. 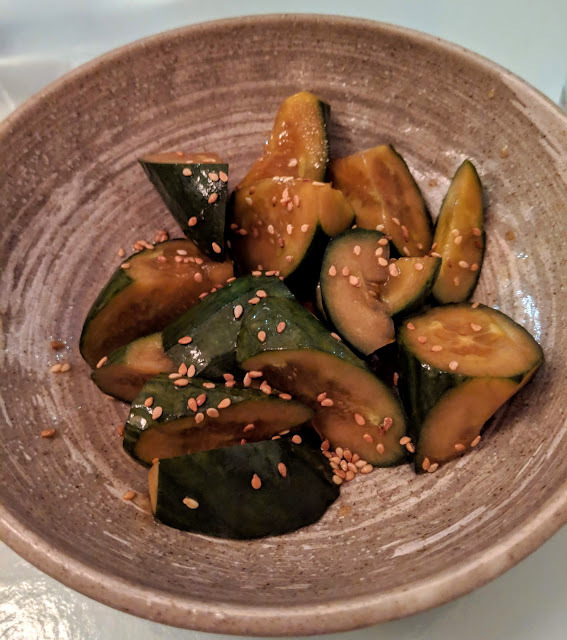 As a starter, I ordered the chilled sesame cucumber to begin the experience. The crisp, cool cucumbers have a delicious bite of vinegar to them and are a delightful curtain-opener for the courses to come. Momo Yakitori's marquee feature are their charcoal-grilled chicken skewers (thus the "yakitori" in their name), which feature Amish-raised chickens in a variety of combinations of seasoning and parts of the bird (you can see those on their menu). For the RAMW restaurant week menu, the yakitori's comes accompanied with a vegetable side and a choice of another meat side or a second vegetable one. For my feast, I ordered the sauce yakitori (Mune Niku) with the baby leeks with tare (negi) and grilled rice ball (yaki onigiri). As a palate cleanser between courses, green cabbage is provided. For a meal so artfully crafted and hyper-focused on food's flavors and textures, I appreciated having it on hand as I jumped between skewers and sides. With the yakitori I ordered, each skewer of chicken features a different sauce: Plum, red miso, yuzu pepper, tare. I regret not taking meticulous notes so that I could tell you which skewer was which, and which I enjoyed the most, but alas, that escapes me now. Never mind that however, because each skewer was a wonderful contrast to the next. 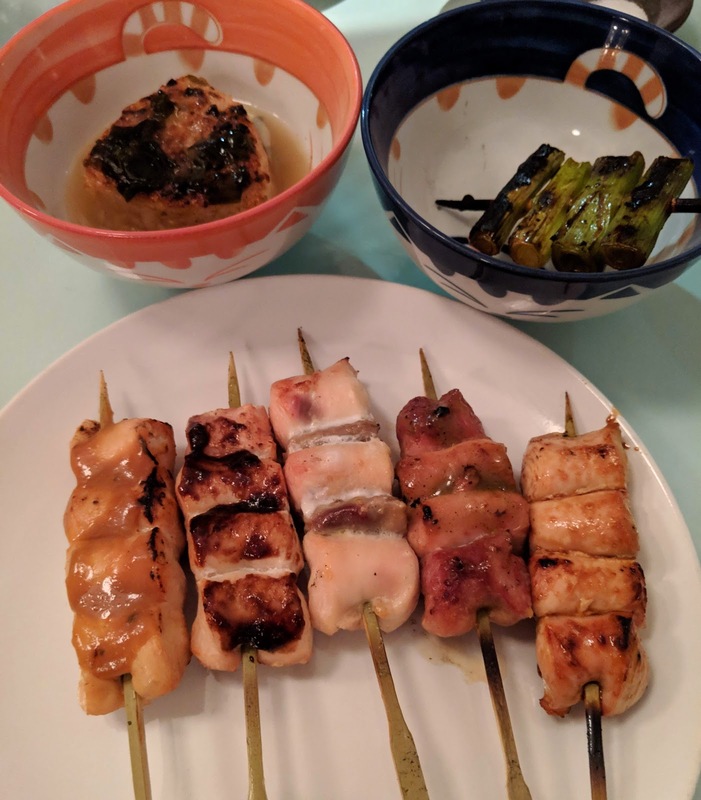 From the sweetness of the plum sauce to the heat of the pepper sauce to the delicious complexity of the tare, I enjoyed slowing down and really savoring each skewer. The tenderness and cooking method of the chicken is hard to compare to anything else I have tried in the best possible way. It's clear this chicken is the highest of quality, as it's juicy and brings a subtle flavor all it's own. This is the ultimate rebuttal to the stereotype of the bland, uninspired chicken breast, and this humble but artful presentation absolutely blew me away. 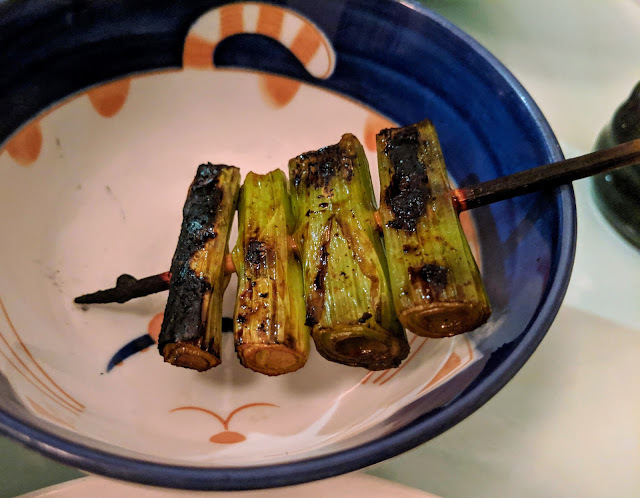 Though minuscule in it's portioning, the baby leeks had magnitude in their flavor, as the fragrant, tender flavor was matched beautifully with the tare, sweet, savory, and umami flavors. This side dish is the ultimate proof humblest of vegetables can be elevated to the most etherial of heights with a devotion to detail. The grilled rice ball is a fun and inspired take on serving rice. Instead of a fluffy mountain of rice presented alongside food, this rice ball features a crunchy exterior and soft interior providing a unexpected textural contrast. The rice takes on a lovely flavoring from the grill, but at the table is covered with a layer of broth to further infuse flavor. I loved this take on rice which reveal the magic of utilizing seemingly simple ingredients in a creative way to totally reinvent and break down expectations. 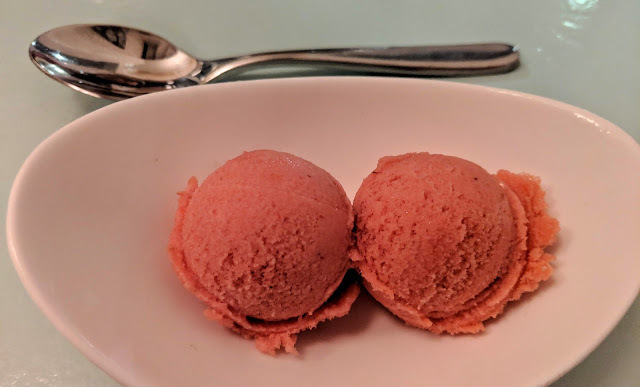 The only dairy-free option among the desserts available was a strawberry sorbet, but this proved to be a fitting finale to the flavor and texture fireworks of the prior courses. Presented in an ice-cold dish, the sorbet was wonderfully light and refreshing flavor. Unmistakably made with real strawberries, this sorbet could put any grocery-store variety to shame. This is the real deal, and the two scoops were exactly the perfect portion to end the meal fulfilled and not overly stuffed. It's been a really long time since I had a dining experience as nourishing to my stomach and senses as this one was. As the meal progressed, I felt my whole body relax and I slowed down to simply enjoy every pleasurable bite. This, this is the pinnacle of what dining out should be. With clear intentionality behind every dish and a evident love of presenting quality ingredients in a captivating way, the Momo Yakitori team easily earned my most enthusiastic regards and deepest respect. I want to shout about my experience from the rooftops, and thank my waiter especially for his hospitality and for guiding me through this culinary journey. It's hard to imagine anyone leaving this experience without being totally satisfied, and I'm glad that their participation in RAMW's restaurant week allowed me to take a deep dive and sample around the menu. 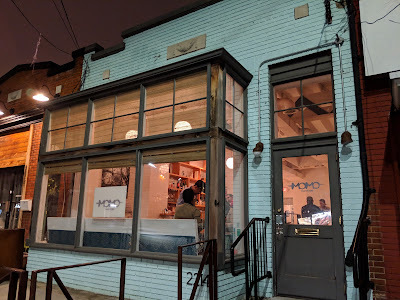 As a hidden gem, I am thrilled to be able to share my experience with you, and eagerly await my next opportunity to pay Momo Yakitori a visit. Price: Click here to see menu prices. See the RAMW restaurant week menu for the $35 dinner special.